Next month, Marvel and IMAX will make cinematic history with Marvel Studios’ Avengers: Infinity War, which marks the first Hollywood film entirely shot using IMAX cameras. Today, IMAX released a special edition side-by-side comparison of the latest Avengers: Infinity War trailer that illustrates just how much more exciting it will be for fans to experience this epic adventure in the immersive IMAX format! Directors Joe and Anthony Russo designed Avengers: Infinity War for IMAX. In addition to it being filmed entirely using IMAX cameras, the movie will be presented in IMAX’s expanded 1.9:1 aspect ratio. 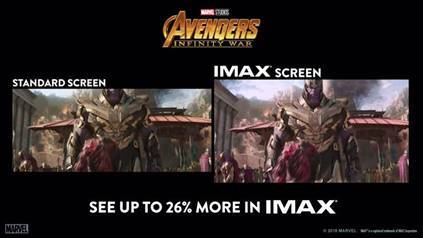 Only in IMAX theatres will the movie expand vertically to show up to 26% more of the image than standard theatres – providing IMAX fans with even greater scope and immersion. In this new video, IMAX presents a side-by-side comparison of the expanded view movie-goers will experience in IMAX versus what they will see in standard theatres. To view the side-by-side trailer, see below. The Russo Brothers utilized the ALEXA IMAX 65mm camera to film Avengers: Infinity War. It is a next-generation revolutionary 2D digital camera developed through a partnership between ARRI and IMAX for use by today's leading filmmakers working in the IMAX® format. The camera, when combined with IMAX’s digital re-mastering process, delivers the highest level of digital image capture and playback resulting in stunning lifelike images with pristine clarity, incredibly fine detail, vivid colors and a higher dynamic range for superior contrast. This camera is no stranger to the world of superheroes as it was first used by the Russo Brothers to shoot the airport battle sequence of Marvel’s Captain America: Civil War, released in May 2016. The IMAX release of Avengers: Infinity War will be digitally re-mastered into the image and sound quality The IMAX Experience® with proprietary IMAX DMR®(Digital Re-mastering) technology. The crystal-clear images, coupled with IMAX's customized theatre geometry and powerful digital audio, create a unique environment that will make audiences feel as if they are in the movie. For more information about Avengers: Infinity War, visit www.imax.com.